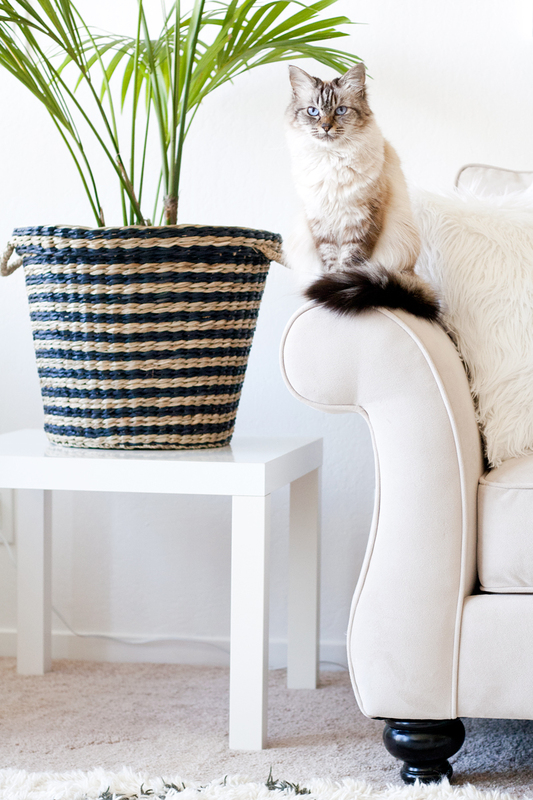 Woven basket from Ikea. Ryandale sofa c/o Apt2B. 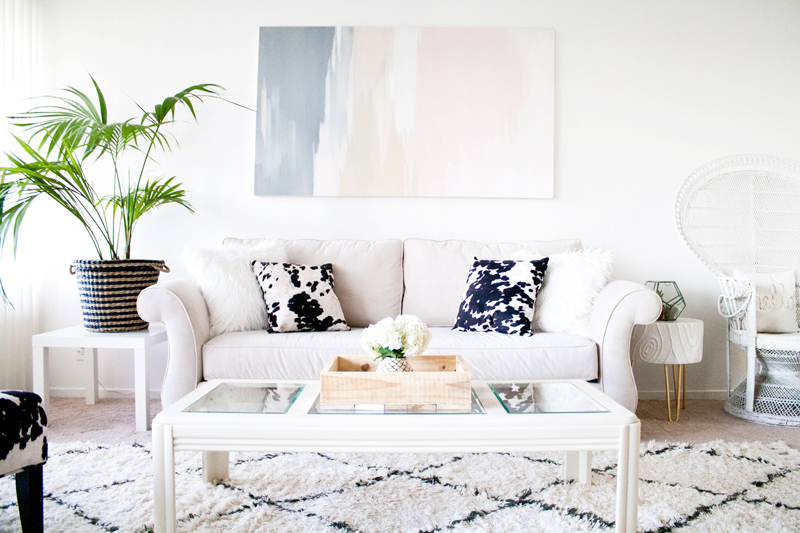 Faux cowhide pillows c/o InspireQ. Faux fur pillows c/o VF Studio. Painting by yours truly. Scallop mermaid hand painted ceramic vase c/o Racoon Valley Rouge. 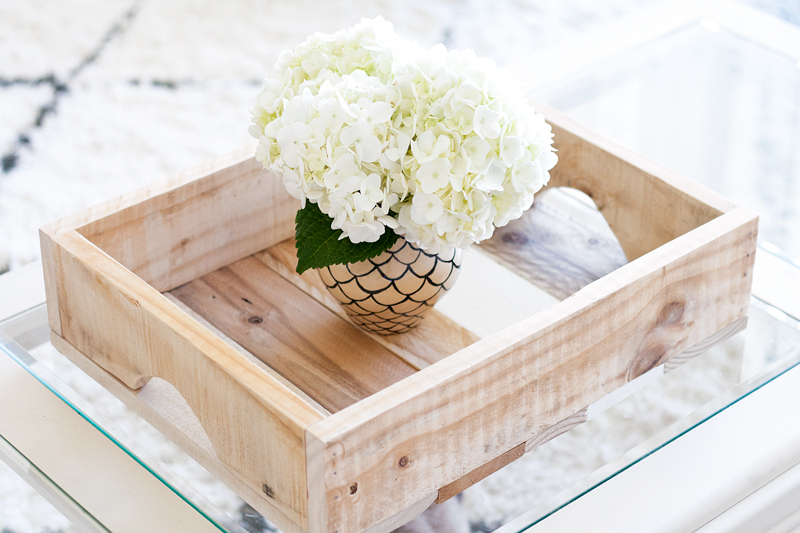 Reclaimed wood tray c/o Reach and Grow. 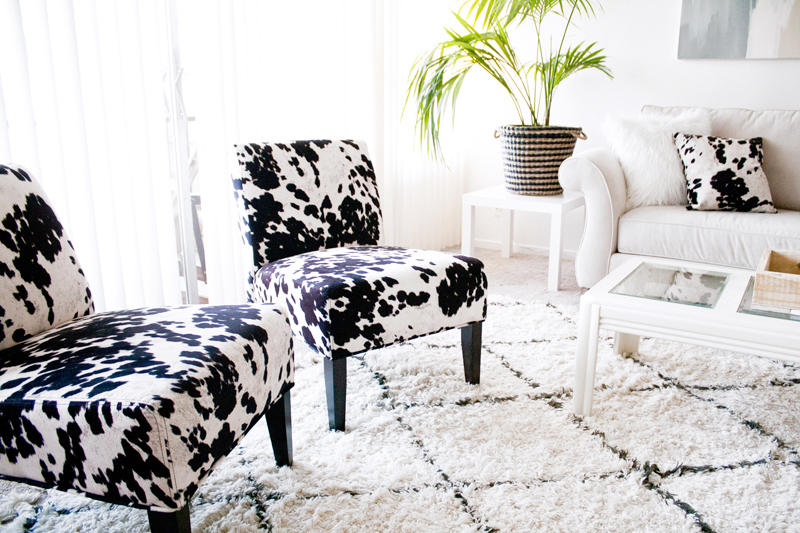 Faux cowhide accent chairs c/o InspireQ. Marrakesh shag rug from RugsUSA. Vintage coffee table $10 from craigslist, revamped and painted by myself. Stumpy table c/o Stray Dog Designs. Vintage peacock chair $25 from craigslist. 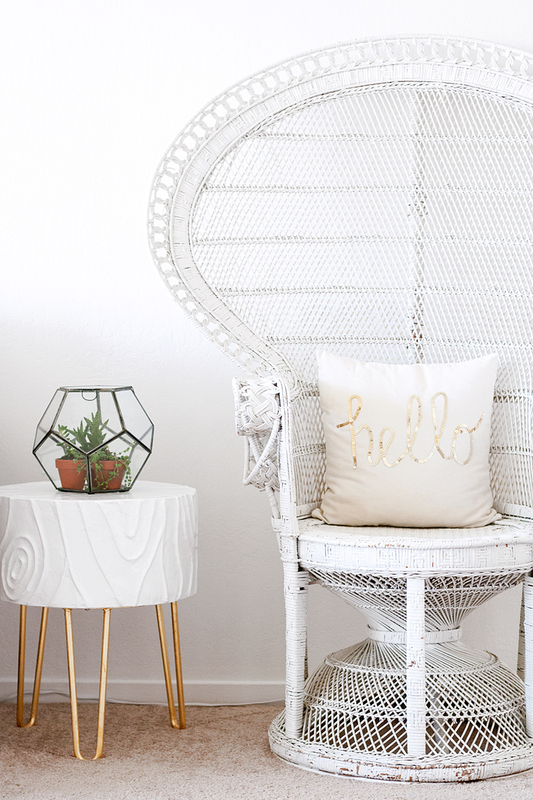 "Hello" pillow c/o Cushion Cut Decor. 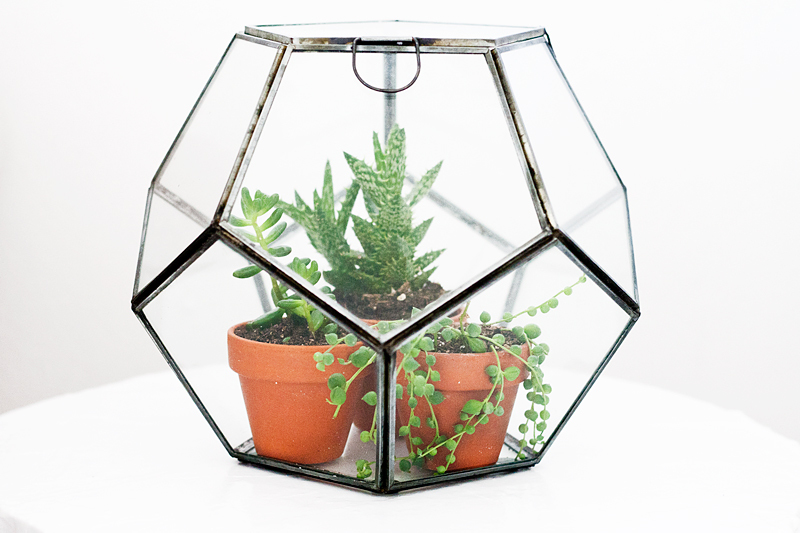 Pierre faceted terrarium c/o Zhush. Shelving unit from Ikea. Woven storage baskets from Ikea. 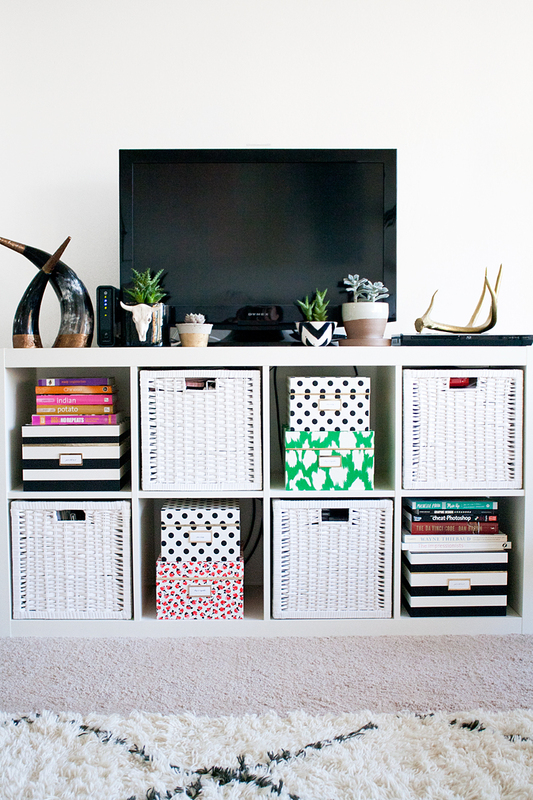 Nesting boxes (floral set and cheetah set) by Kate Spade c/o The Organizing Store. Brass embossed authentic horns set c/o Zinc Door. 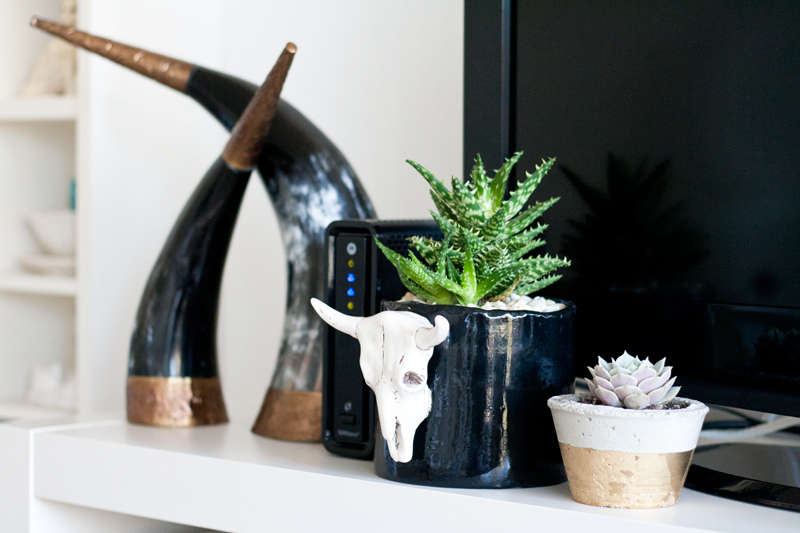 Handmade cow skull ceramic planter c/o Hello Sweetie. Gold concrete planter c/o Nimwit Studio. 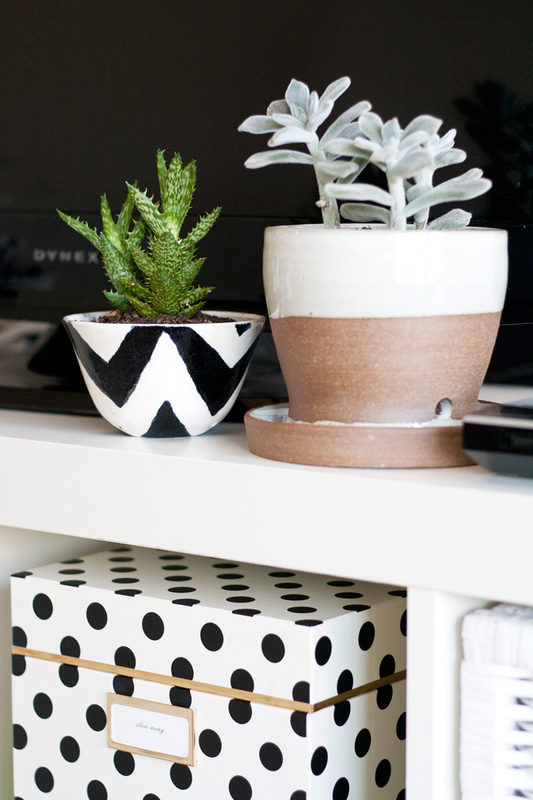 Black and white chevron ceramic planter c/o 3 Girls and a Kiln. 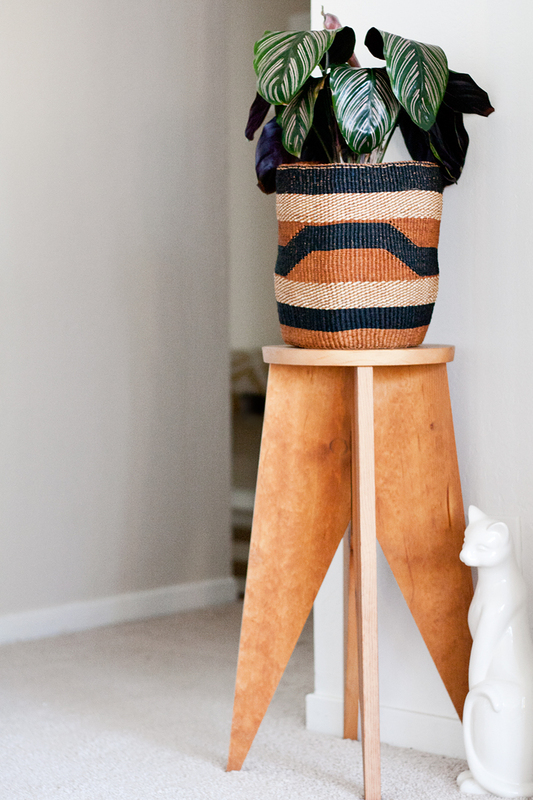 Two tone clay planter c/o Christi Ahee. African Sisal woven utility basket from Half Hitch Goods. Reclaimed pine plant stand c/o LLTT Goods. Ceramic cat figurine from Ross. This is one of my cats Sushi. My other cat Ravi(oli) did not want to be in this shoot! And don't you just love the curvy rolled arm of the Ryandale sofa? Hope you have enjoyed checking out my living space! 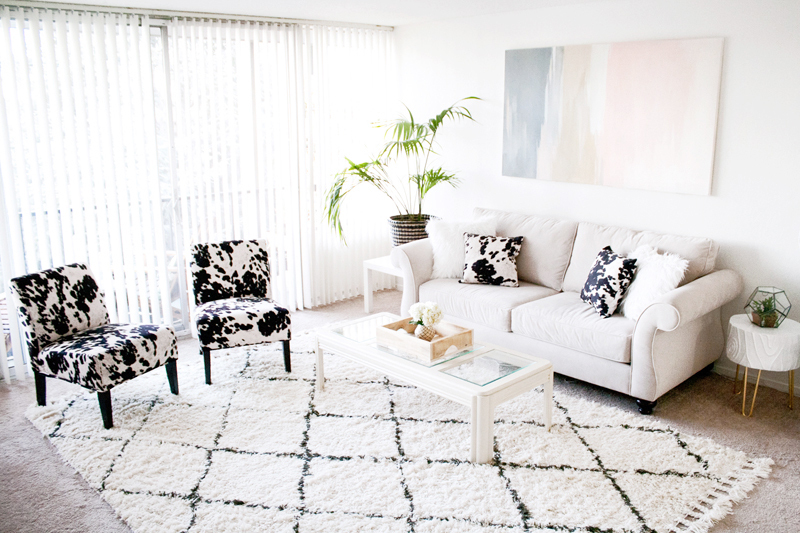 Enter below for a chance to win 1 faux cowhide accent chair + 2 faux cowhide accent pillows from InspireQ. These pieces are some of my favorite things in my home and I am sure you will love them just as much if not more! Contest ends November 12th at 7pm. Please note that this contest is for US residents only and the winner will be responsible for the shipping cost. Good luck! What size is the rug from usarugs? I totally agreed with you time is much more challenging these days! Love the way you put that decoration.